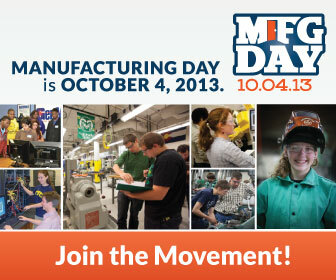 Friday October 4, 2013 is Manufacturing Day. NEPIRC will be celebrating our local manufacturers during the week of September 30 – October 4 2013. Manufacturing Day is a great opportunity to shift Americans’ perception that it is not our grandfather’s manufacturing anymore and to shine the spotlight on the manufacturing industry for what is really is – a high-technology, innovative, and forward-thinking industry that offers good-paying careers to educated and highly-skilled workers. It’s a day to celebrate the hard-work, innovative spirit and get-it-done attitude of the 12 million men and women across the nation who together make the United States the world’s largest manufacturing economy. With the “Buy American”, “Make It In America” and “U.S. Made” movement being stronger now than ever, Manufacturing Day is a time to recognize and celebrate the companies, leaders and employees that create great value within our communities. To register for the Towanda Lunch Event or for more information Click Here. Due to a scheduling conflict, the evening reception has been canceled. We encourage you to attend the Lunch Presentation in Towanda to hear John Brandt speak about Manufacturing in the Northern Tier and Northeast regions of Pennsylvania. What does it mean to have John Brandt speak in NEPA for manufacturing day? Bringing John Brandt to northeastern and the northern tier of Pennsylvania on National Manufacturing Day gives our regional manufacturing executives, economic development officials, educational leaders and business community members access to one of the nation’s foremost thought leaders on the importance of manufacturing to our community, our Commonwealth and our country. As founder and current CEO of the MPI Group – a world-class industry research, analysis and consulting firm – Mr. Brandt will share with us his firm’s insight into the best practices among successful manufacturers and emerging trends within the manufacturing sector. He’ll also provide information about the importance of Customer-Driven Innovation, Sustainability, New Technology Utilization and Supplier Relations to today’s growing companies. What can audiences expect from the presentation? Audiences can expect Mr. Brandt to share information regarding the current state of manufacturing within northeastern and the northern tier of Pennsylvania – which sectors are growing, which sectors continue to face challenges, and how manufacturing overall impacts our regional standard of living. Mr. Brandt will highlight which manufacturing sectors our region has a competitive advantage within, and explain why we have that advantage. He’ll also share with the audience his suggestions for how our region can expand its manufacturing base and, more specifically, how manufacturers in other regions are addressing challenges similar to those being experienced here by our business community. Mr. Brandt’s presentation will be data-rich and appropriate for the business, economic development and educational community – but also be delivered with lighthearted humor appropriate for a day of celebrating with, and recognizing, our manufacturers.